KUCHING: Four Special Olympics athletes from Sarawak will be representing Malaysia in the World Summer Games to be held in Los Angeles, the United States from July 25 to Aug 2. They will be joined by 36 other athletes from Sabah, Labuan, Kedah, Perak, Selangor and Kuala Lumpur to form the national contingent. Kuching’s track athletes Sharifah Saidatul Nuramira Awangku Abdul Malik and Nur Nadhirah Syamsol will compete in the middle distance and sprints respectively. The two other athletes from Sibu and Miri will participate in bowling and swimming events. “I am excited and happy as I want to win this game for the country and make Sarawak proud,” said Sharifah prior to departure at the Kuching International Airport yesterday. At the airport to send off the duo, Kuching Special Olympics Chapter chairman Datin Dayang Mariani Abang Zain and coach Ruhana Bujang, was Minister of Welfare, Women and Family Development Datuk Fatimah Abdullah. “This is a manifestation that our special children who are mentally challenged if given the chance are more than capable to hone their skills in sports and being able to compete on the international stage,” said Fatimah, who is Sarawak Special Olympics president, during a press conference at the airport. 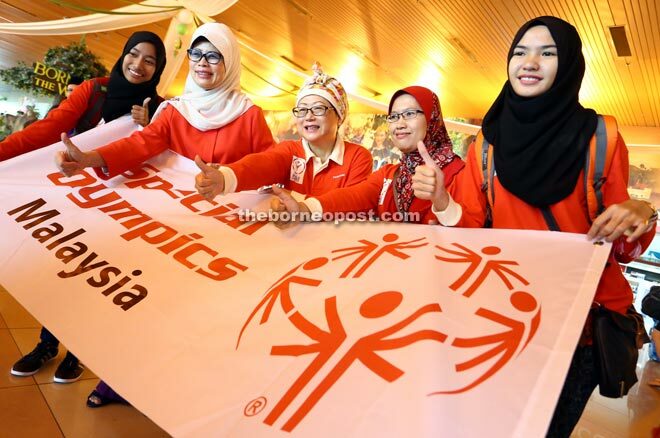 She further stressed that the athletes should be role models for parents to consider enrolling their special needs children in the various Special Olympic chapters in Kuching, Sibu, Miri and Bintulu. She hoped that more members will come forward to register at the state chapters which not only train the children in sports but also prepare them through various modules such as the free ‘Healthy Athletes’ programme. Sarawak, she said, has a total of 44 community-based rehabilitation centres (CBR) with a large number of students having potential for sports under the Special Olympics or for the Malaysian Paralympic Games. “Sarawak will be the host for the paralympic games next year. We are also proud that the state has been the champions of the games for eleven times,” she added. Besides CBRs, mentally challenged students who are autistic, with down syndrome and slow learners would be integrated with other students at selected primary and secondary schools in the state. The Special Olympics World Games in Los Angeles will gather an estimated 7,000 athletes and 3,000 coaches from 177 countries.